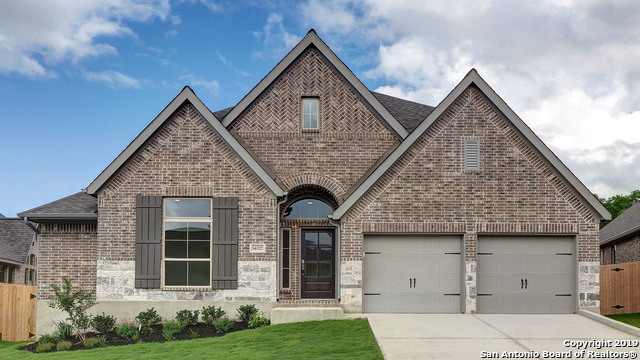 All Bella Vista homes currently listed for sale in San Antonio as of 04/22/2019 are shown below. You can change the search criteria at any time by pressing the 'Change Search' button below. "Library with French doors set at entry with 20-foot ceiling. Rotunda ceiling. Formal dining room with ceramic tile floor. Spacious family room with an 18-foot ceiling, ceramic tile floor and a wall of windows. Island kitchen features a walk-in pantry and is open to the morning area. Private master suite features a curved of wall of windows. Master bath includes a corner garden tub, separate glass-enclosed shower, dual sinks, a linen closet and a large walk-in closet." "PERRY HOMES NEW CONSTRUCTION-Two-story entry with a circular staircase. Library with French doors. Formal dining room with ceramic tile floor. Two-story open family room with ceramic tile floor features a wall of windows. Kitchen and morning area open to family room. Master bedroom with 12-foot ceiling. Master bath with dual vanities, garden tub, a separate enclosed glass shower and a walk-in closet. Secondary bedrooms, game room and media room completed the second level. Covered backyard patio." "Library with French doors. Formal dining room. Two-story entry and family room with wall of windows. Kitchen features island with built-in seating space, a walk-in pantry and opens to morning area. Private master suite with a curved wall of windows. Master bath that features a garden tub, glass-enclosed shower, dual vanities, a linen closet and two walk-in closets. Guest suite with full bath and walk-in closet on each floor." "Two-story entry. Library with French doors. Kitchen features a large pantry and a island with built-in seating space. Two-story dining area opens to two-story family room with four large windows. Private master bedroom. Double doors lead to master bath with dual vanities, a large garden tub, a separate glass enclosed shower and a large walk-in closet. Private master suite with a walk-in closet and full bath. 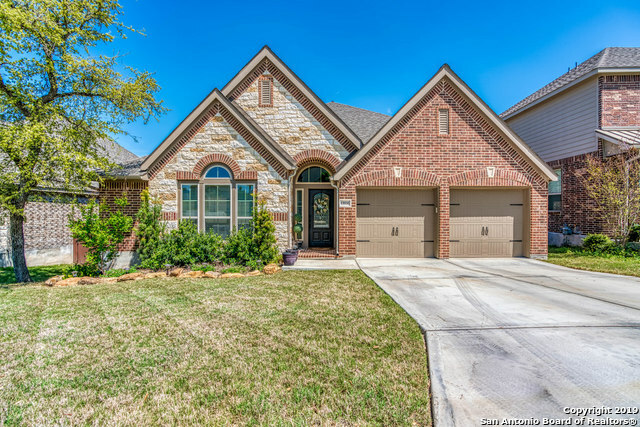 Media room with French doors, game room and secondary bedrooms complete the second level"
"Extremely upgraded elegant Perry Home located in the Bella Vista subdivision off Potranco Road. This home sits on a corner lot with unmatched curb appeal. 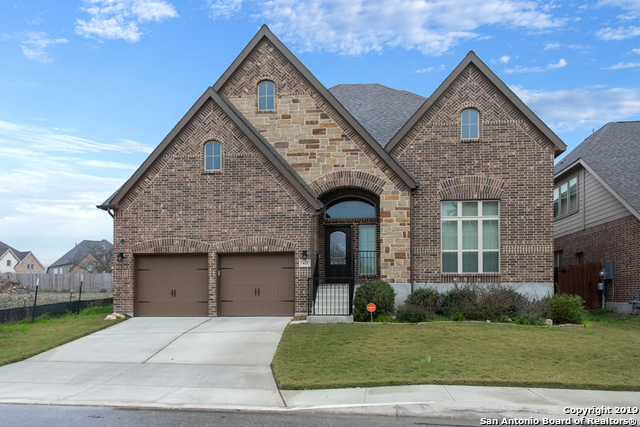 Enter this home to a large one story layout with tile flooring throughout all common areas. Spacious formal dining / office. Large family room and gourmet upgraded kitchen with built in double ovens, gas cook top & more! Huge master suite with full bath & garden tub attached. Full deck in backyard w/ video. 16 ft garage w/ high lift doors. 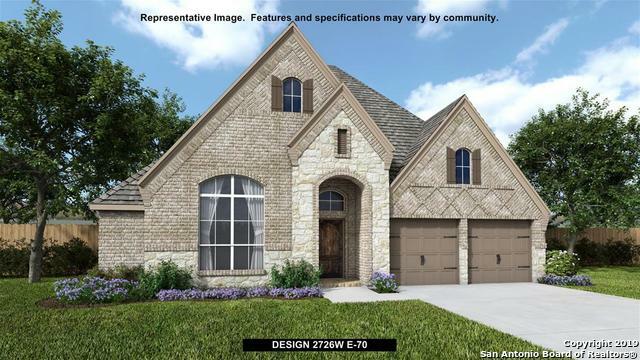 Vie"
"Located on a corner homesite. Entry with a 12-foot ceiling. Kitchen features an island with built-in seating space. Dining area with a wall of windows. Game room with French doors. Open family room with ceramic tile floor features a wall of windows. Secluded master bedroom with a wall of windows. Double doors lead to master bath with dual vanities, corner garden tub, a separate glass enclosed shower and a large walk-in closet. Extended covered backyard patio. Sprinkler system. Two-car garage." 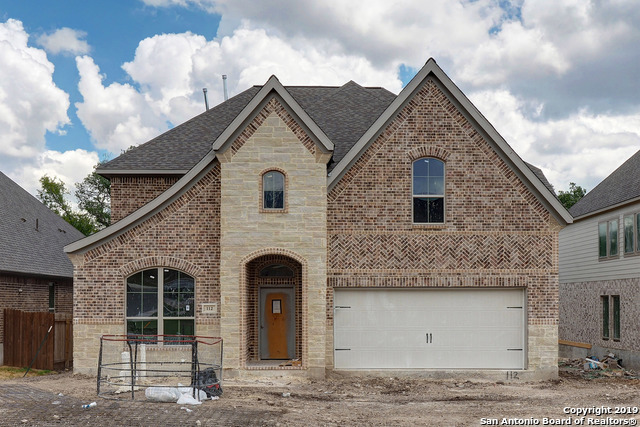 "Beautiful Perry home with all the upgrades, but cheaper than building new. Library with french doors set at entry with 20ft ceiling. Rotunda ceiling. Spacious family room with 18ft ceiling and tons of natural light. Designer kitchen with cream cabinets and surplus of cabinets and counters. Downstairs master with curved wall of windows and downstairs guest suite with full bathroom. Curved stairs with rod iron leading to game and media rooms. 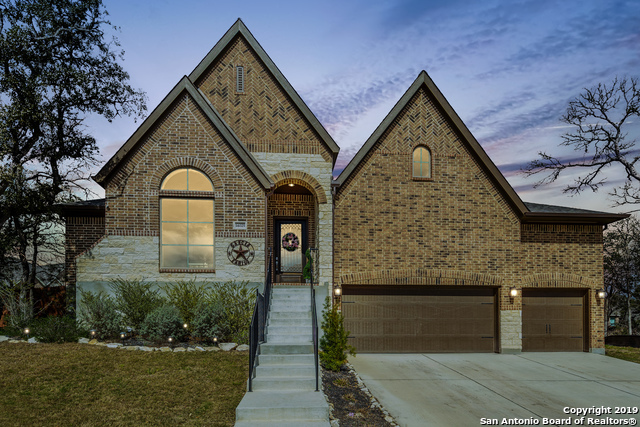 Great schools near by and easy access to 1604, 90 and I"
"Extended entry with 12-foot ceiling leads to spacious family room with a wall of windows. Formal dining room. Library with French doors. Island kitchen featuring built-in seating space and a walk-in pantry opens to morning area and family room. Private master suite. Master bath includes garden tub, separate glass-enclosed shower, dual sinks and two large walk-in closets. Guest suite with full bath and walk-in closet. Game room with double doors. Mud room. Two-car garage." "This Large beautiful home has many extras. 5 Bedrooms, 1st level Master Bedroom with Sitting area and dual walking closets. Large open concept living area, Great for entertaining, Large kitchen with walk in Pantry and separate Butlers pantry. Movie room and Game room are upstairs overlooking the living area. Two Length of the house covered decks overlook the beautiful Greenbelt behind the home. Home office with walk out to the foyer. One of the bedrooms has its private balcony. Solar Panel inst"
"One-story design with 12-foot coffered ceilings in entry and extended entry. Spacious formal dining room. Library with French door entry. Open family room with ceramic tile floor flows into the kitchen and morning area. Kitchen features island with built-in seating space. Master suite with wall of windows in the bedroom. Garden tub, separate glass-enclosed shower, dual sinks and a large walk-in closet in the master bath. Guest suite. Stage of construction is Frame on the day of entry." "Totally remodeled 4 bedroom, 3 bath home located on Mustang Island just minutes from Port Aransas and Corpus Christi. The home boasts several decks to sit out and enjoy the ocean breeze while sipping your morning coffee or glass of wine while taking in the breath taking sunsets!. This home has been an awesome investment and has been in the rental pool for several years. Annual revenue reports will be provided upon your request." 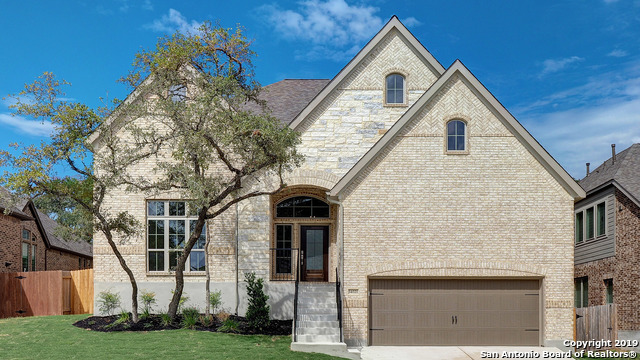 "One-story design with 12-foot coffered ceilings in entry and extended entry. Spacious formal dining room. Library with French door entry. Open family room flows into the kitchen and morning area. Kitchen features island with built-in seating space. Master suite with wall of windows in the bedroom. Garden tub, separate glass-enclosed shower, dual sinks and a large walk-in closet in the master bath. Guest suite. Game room with double doors. Mud room adjoins the oversized utility room. Two-car gara"
"5 years old PERRY HOMES well maintained like new house. Formal living room by the entry, Two-story entry leads to family room with ceramic tile floor, cast stone fireplace, high 18-ft ceilings. Formal dining room. 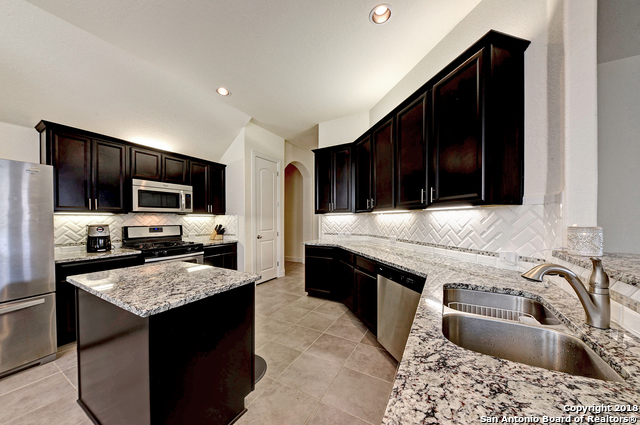 Kitchen features island, granite countertops, 42-inch raised panel cabinets and walk-in pantry. Spacious master suite with 13-foot ceiling and a wall of windows. Garden tub, separate glass-enclosed shower, dual vanities and two large walk-in closets in the master bath. Downstairs guest"
"Entry and extended entry with 12-foot ceilings. Library with French doors off the entry. Open kitchen features an island with built-in seating space. Open family room with a wall of windows. Large private master suite. Double doors lead to master bath with two large walk-in closets, dual vanities, garden tub, and a separate enclosed shower. Covered backyard patio. Mud room off of two-car garage." "Gorgeous 4-bedroom home on cul-de-sac and green space for privacy. The home features 3 main level bedrooms and a 4th with full bathroom and loft upstairs. Open concept family room features tall ceilings, lots of windows for tons of natural light. Gourmet kitchen is equipped with gas cooking, large island and huge walk-in pantry. The Master suite features a large arched window with great views and double vanities, garden tub, separate glass enclosed shower and large walk-in closet. Many other ext"
"Fabulous outdoor living space with no back neighbors await you at this wonderful Highland-built, cul-de-sac home! 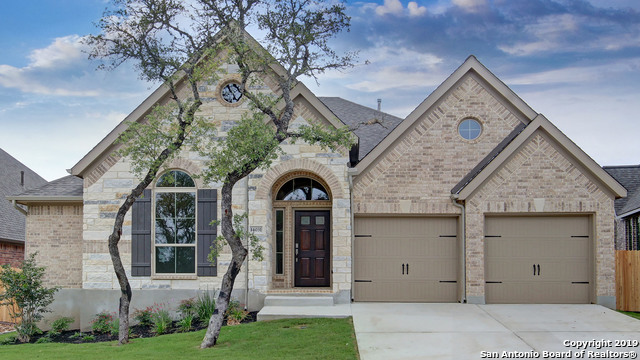 Within walking distance to the amenity center, this home has plenty of room and designer touches such as custom Roman shades, wood flooring, double crown moulding, and wood blinds. 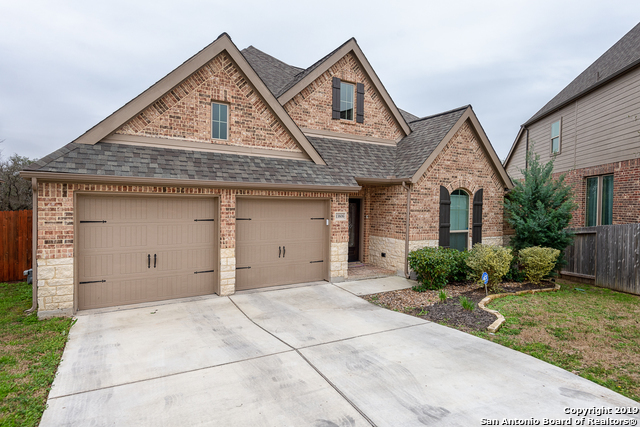 Located a mere 4.1 miles to shopping (closer to the coming HEB at Potranco/211) and an easy commute via 211 to Lackland AFB, this location will give you the country feel with easy access to the necessiti"
"**Open house Sat. 20 April 10am-1pm** Perry home on premium lot in coveted Bella Vista community.This 3 bed 3.5 bath boasts an open floor plan, Water Softener & UV Air Filtration system. Upstairs 1/2 bath, large closet & a pre-wired Movie Theater room (could be 4th bedroom). All bedrooms have walk in closets & ceiling fans. 2nd bedroom has private bath. 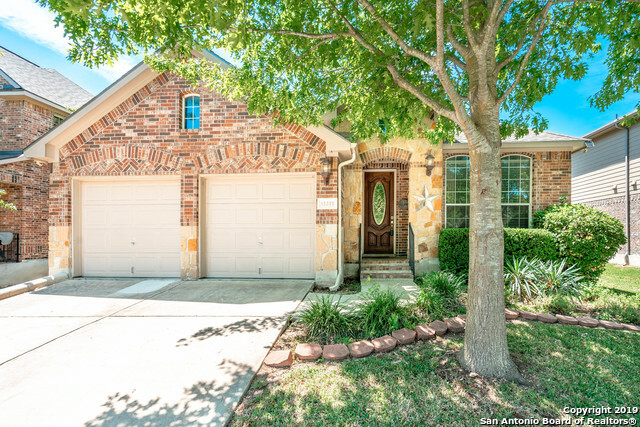 Oversized back porch overlooks a greenbelt & large yard featuring mature trees & Tuff Shed. 20 mins to Lackland/Kelly.Top rated NISD Junior HS &"
"Need room for everyone? Wonderful space in this 6 bedroom home! 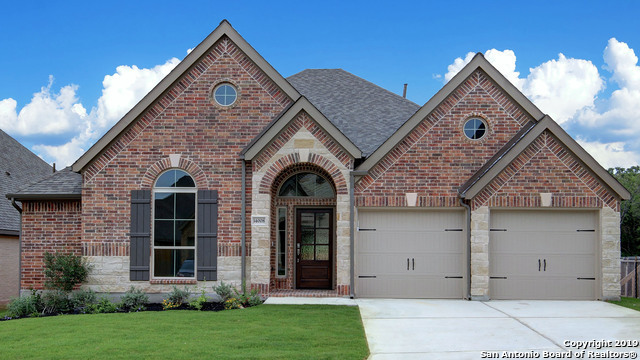 Enjoy the 11 ft ceilings in family room with 8' doors. Upgraded kitchen includes granite, gas range, beveled subway tile bksplsh, island and under counter lights! 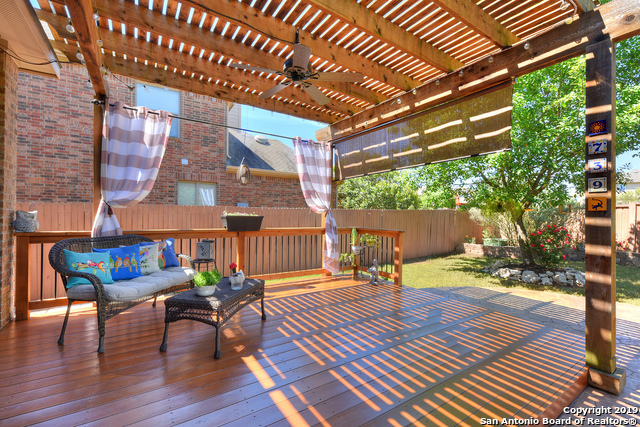 Outdoor living on the 19x12 covered patio plus sprinkler system, mature trees. Entertain inside w game room plus a media room upstairs along with 4 bedrooms and 2 full baths. Master & guest room down. Oversized 2 car garage. 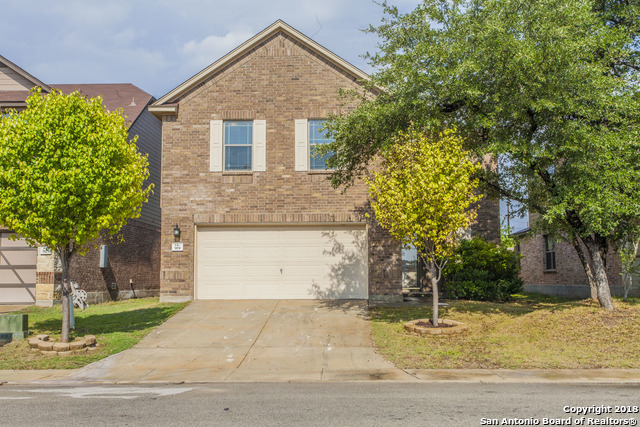 Great NISD elem & middle schools within the "
"Stunning 4 bed 3 bath one story home with study, media room & guest suite in highly sought after Bella Vista subdivision. This home looks & feels brand new. New wood tile floors were put in just a few months ago. 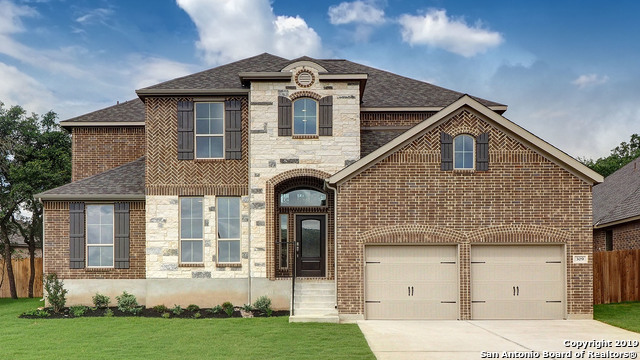 Very open floor plan, combined with 12' ceilings, floor to ceiling windows, the large kitchen, spacious dining room & covered patio scream for entertaining! Split floor plan gives ultimate privacy for guests! Conveniently located to shops, restaurants, schools & Lackland AFB. This is a "
"Wow a Great Community with playground area that includes a pool. Over 3000 sq ft home on an amazing corner lot, gourmet kitchen featuring granite counter tops, Island, and Stainless Steel appliances. 3 living areas, 2 eating areas, game room, with master downstairs. Solar Panels to help cut your electrical bill. A must see so don't miss it!!" "Beautiful 1.5 Story Highland built home on a Greenbelt Lot has 4 Bedrooms/3 Baths & 2 Living/2 Dining*High Ceilings & Crown Molding though-out most of downstairs*Island Kitchen boasts Granite Counters & Gas Cooking*Gorgeous Wood Floors in Mstr Suite w/ Double Vanities & Separate Tub/Shower*Open Floor-plan, Natural Light*FP w/Gas Logs in living area*Large Game Room, 4th Bedroom & Bath Upstairs*2 Blinds,4 Sides Brick/Stone, Sprinkler System,Water Softener,2 HVACs,2 Water Heaters,Covered Patio & Ma"
"A beautifully updated 4bed/2.5 bath home located in a great family-friendly neighborhood, Bella Vista. Great layout, open floorplan, designer colors, new interior paint, island kitchen, new stainless appliances, beautiful ceramic wood flooring covering the first floor, updated bathrooms with all new plumbing and light fixtures, new carpet throughout the upstairs, huge master bedroom with large bathroom and walk-in shower. All this and a big backyard located on a greenbelt. This house is a must s"